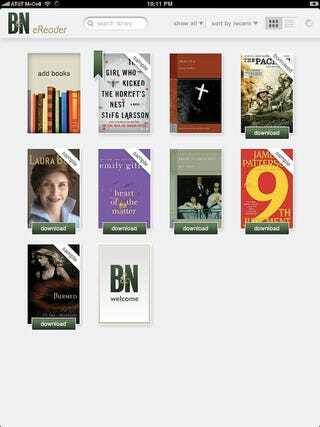 Barnes & Noble's free eReader app is here, and shockingly, it's probably the best ebook app on the iPad, for now. Better than Kindle, and better than iBooks. It's kind of a cross between Apple's iBooks app and Amazon's Kindle app, bringing the best (and worst) of both into a single app, with a few extra features from the nook. • It has way more books than iBooks, and is catching up to Kindle. B&N's official number is over a million, but half of those are works in the public domain. For instance, it matched our Kindle books spot check exactly, and had the same prices as Kindle for all of those books. • Barnes & Noble's killer feature, lending books, is fully intact. It worked perfectly, with a notification that I had a book available to borrow when I booted up the app. The trick is finding books that are actually lendable, since not all of them are, and the LendMe badge is easy to miss. The crappy, WTF part is that you actually have to enter a credit card number or already have one on file with B&N in order to read the borrowed book (because their LendMe DRM is tied to your credit card, which sounds a little dicey on the surface of it). Either way, it's a good feature that could be killer if it was done better. • Buying books shoots you out to the browser, which isn't simply jarring, but the B&N site is not a bag of fun to navigate on the iPad. While Apple might be tying their hands here, preventing them from integrating the store into the app like iBooks, they could at least come up with a custom iPad storefront, a problem Kindle suffers from as well. In fact, a few times I tried to download a sample, it just wouldn't work, so it borders on broken. • The overall syncing and library management system just isn't as nice as Kindle. Let's face it, Amazon nailed the backend. Also, it's kind of buggy on this build, in that I couldn't find a way to kill Laura Bush's biography or whatever off of my iPad—even resorting to the B&N website, trying to remove the book kept giving me an error. Like Amazon, Barnes & Noble's endgoal isn't actually to sell you a slab of plastic and silicon. It's to sell you an ecosystem, to glue you to their platform. That's why you can read their books on iPads, nooks, computers, BlackBerrys, whatever. They don't care about the thing you're reading on, so long as they're selling what you're reading.